BAGHDAD, Iraq � A suicide car bomb detonated outside the entrance to the Green Zone also known as "Assassin's Gate" near Coalition headquarters in Baghdad early Sunday, 18 January. At least 31 people were killed. According to sources close to Zinda Magazine in Baghdad fourteen Assyrians were either killed or wounded. Paul Bremer, the top U.S. civilian administrator in Iraq , condemned the attack. In a statement posted on the Coalition's Web site, Bremer mourned the "innocent victims" and reaffirmed the U.S. plan to handover authority to Iraqis later this year. The identity of one person killed was given to Zinda Magazine as Sargon Shawel and another injured person as Polous Khanna. According to Mr. Atheer Tallo , a Zinda Magazine reader in the United States , another victim of the attack was his cousin, Hadeel Louis Asmaro. Ms. Hadeel was in her early 20s, a university graduate who was engaged to be married to a physician in Denmark. She was working as a computer programmer nearby the location of the attack. 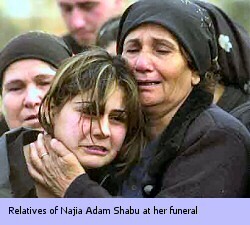 On 21 January, three Assyrian and one Armenian women died when masked gunmen raked their vehicle with automatic fire. Five other women and the male driver were wounded. The Armenian victim, Askhik Varojan, worried about her job in the laundry of a U.S. military base after insurgents began targeting Iraqis who were cooperating with the occupation forces. She boarded a minibus Wednesday for her job at the U.S. base at Habaniyah, 50 miles west of Baghdad , determined to hand in her resignation rather than live in fear. "She went yesterday to tell them that she wouldn't go to work any more and to claim her salary," Varojan's sister, Eida Varojan, sobbed. Varojan took the job at Habaniyah three weeks ago to support her paralyzed husband and four children, relatives said. On Thursday, her coffin was brought to the dingy one-room apartment, where relatives gathered to mourn. Her 20-year-old daughter, Anjel, fainted from grief. "Come and see our home in order to know why we work (with the Americans)," said another daughter, Emma Hagoub, 25. "My father had a stroke and can't work. We live six people in one room." Vera Ibrahim, 39, one of the survivors of Wednesday's attack, said some of the women were dozing when an Opel car began pursuing their vehicle and two buses traveling in convoy on the highway between Baghdad and Habaniyah, where the women worked. The two buses accelerated but the minibus could not keep up, she said. When the Opel came abreast of the minibus, four men, their faces covered with checkered cotton masks, began firing at the tires. "Without thinking, I hid my head under the seat," Ibrahim said from her Baghdad hospital bed. "The driver kept speeding and the shooting continued. Then the driver got injured, and he swerved toward the wrong side of the road." She said the attackers fled when they saw another car approaching. "When it became silent, I shouted to the people who gathered around," she said. Ibrahim said three women immediately and a fourth was mortally wounded. Police confirmed the death toll. Ibrahim said she started working at Habaniyah two months ago because she needed the money. 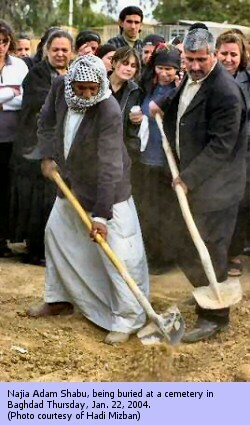 Unemployment in Iraq runs between 50 and 60 percent. "I won't continue this work. I am afraid. They wanted to kill us all," she said. Relatives of the dead said they realized they were at risk by working for the Americans. "But it is a question of money," said Seita Noubar, 48, whose sister Sona was among the dead. "What can we do? She just wanted to earn a living." Of the attackers, Noubar said: "If they were real men, they would have gone after men and fought Americans with tanks, not poor women."